proved I was not hallucinating by touching them. genuineness would be in the results. The séance was held in a room about 4Oft. long, illumined by a good red light. was told to touch her hair and b feel all down one side. and touching them both at the same time. me to my original seat. were taken by a commercial photographer, Jack Edwards, with infra-red equipment. curtain and platform before the séance. Edwards allowed fifty to sixty seconds between each exposure. Barbanell or viewed on http://survivalebooks. Yes but where is the evidence? Thanks Z and Jim. The photos are interesting but Silver Belle doesn't look like other people present. I am not suggesting these are fake but I don't think they would convince most people do you? obiwan wrote: Thanks Z and Jim. The photos are interesting but Silver Belle doesn't look like other people present. I am not suggesting these are fake but I don't think they would convince most people do you? Maybe not but to the people who were present at the seance they were very real. Maybe that is why Alec Harris's guides would never allow photographs to be taken. The people I spoke to in his seance were very real .........until they simply melted away! I hear you Z. I am not doubting the testimony, merely the evidential value of the photos. I am not convinced any photo or recording would be acceptable as evidence these days given the capabilities of technology. It is one of the problems in many photo's (except the one's from Minnie Harrison look much more like real people) I can see what Obi means. I have heard the proposition made that these were a projection into mist from dry ice but I do not think that explains it in any way either. However, I do know that the disgraced Camp Chesterfield were capable of such chicanery from Lamar Keene's book Psychic Mafia. Sadly, my information from the USA suggests that Camp Silver Belle has, in modern times, been similarly tainted. Like Z says though, the testimony from the eye witnesses about the other materialised loved ones who appeared, whilst the medium could be seen, is quite compelling. obiwan wrote: I hear you Z. I am not doubting the testimony, merely the evidential value of the photos. I am not convinced any photo or recording would be acceptable as evidence these days given the capabilities of technology. We must bear in mind that these photos were taken with infra-red photography many years ago when infra-red as in its infancy. Jack Edwards was a commercial photographer who was interested in the Post-Parrish seances and wanted to capture them on film. I have also seen other spirit photographs taken by him showing spirits above the heads of the sitters. I agree that technologically today photographs can be produced to show similar results. The clincher for me was Barbanell's testimony to the reality of Silver Belle's materialisation. Having sat in a physical seance with Barbanell, and having read his subsequent report of the seance, I can state unequivocally that he never exaggerated his reports in any way. They were completely factual and what he saw everybody saw. I am not doubting the testimony. Just commenting on the likelihood that the photos will be accepted as evidence by those not present who do not know the people giving the testimony to support them. I have discovered that these pictures may well be a set up created in the darkroom despite what is written above. It would not deny the eye witness reports but would be very unhelpful to the history. I will try and dig up whether the rumour is fact or sceptical fiction. Silver Belle! That's the name I was trying to think of a few days ago, when I mentioned the photographs in Barbanell's book that looked faked to me. I can't impugn the integrity of anyone at this seance, or challenge what they say they saw: not having been there. However, I CAN say that the alleged spirit figures in Photos 6 and 7 above - and those are the photos I was referring to before - look like fakes to me. What intrigues me is that photos do not seem to have been taken at the same seance that Maurice Barbanell is writing about. The pictures show the curtain held open to reveal the medium, yet Barbanell's account implies that the curtain was drawn. Also, it's odd that the photographer knew exactly where Silver Belle would materialise and had her nicely in frame from the very first photograph. Yes it is an interesting puzzle, the worst thing is Ethel Post Parish was related to one of the key people involved in the fracas at Camp Chesterfield. However the Barbanell account is an impeccable record and he was a fierce opponent of fraud. I wonder if anyone examined the negatives of those photos, to see if they were manipulated in any way? This is to certify that Ethel Post, of Miami, Florida, a trumpet and materialization Medium, held a series of seances in the City of Kitchener, Ontario, Canada, under the auspices of the Ontario Society for Psychic Research. Before giving a public seance the Committee had the Medium give a sitting under severe test conditions to prove that her work was genuine. She was sewed into a bag with only her head outside and in such a manner that it would have been impossible for her to make use of her hands and feet without breaking the cords used in sewing the bag. The results obtained, even under those severe test conditions, were excellent and entirely satisfactory to the Committee, who were satisfied that the manifestations were genuine. The following were members of the Committee: Mr. and Mrs. C. W. Schiedel, Mr. and Mrs. F. Tylinski, Mr. and Mrs. A. H. Seibert, Mr. E. Huehn, Mr. J. Bohnsen, Dr. J. E. Hett and Mr. E. Hamel. By A. H. Seibert, Sec'y and Treas. Now this is an interesting blog and the book she reviews appears fascinating. Actually Waller we have good reason to believe that tehse pictures were manipulated in the dark room, the credibility of Silver Belle comes more from the testimony of Maurice Barbanell and others who who attended and certified the séances. However, I have had further reports which also suggest that Ethel did work the same scams that Camp Chesterfield did. A US medium, who has a great interest in history, directed me towards a book from once committed Spiritualist and former camp visitor (plus, of course the blog connected above). Indeed my concern about this particular slide is it could very easily be dismissed as a creation through the use of dry ice. 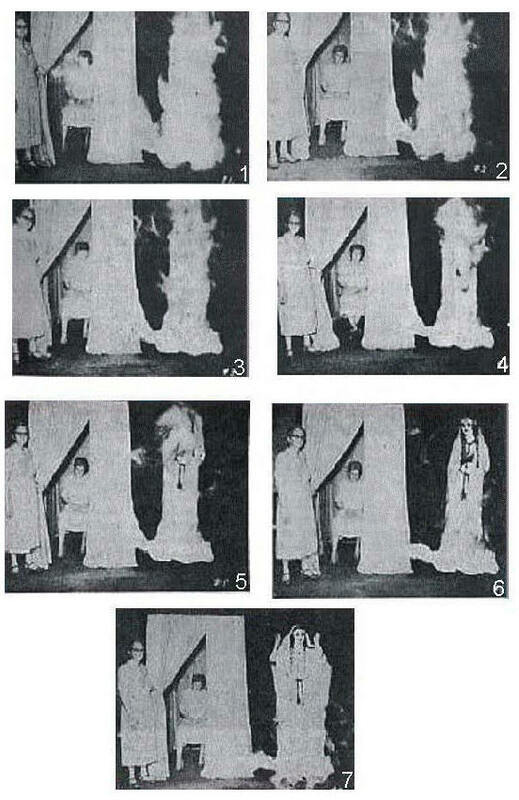 Here's a thought, and I don't know the answer to this: Is it possible that the pictures were intended as a representation of what happened in the seance room? (just thinking laterally). Thanks for that its a very good point. Yours too Obi I believe that's exactly what was intended. Sadly no one made that clear so it leaves the whole issue as an open goal for the sceptics. The US medium I communicate with ,is, like many over there because of the frauds that have occurred, very anti dark séances and the NSAC has a ban on their churches running them. To be honest I have found many in the US lump Ethel with her relative who was caught cheating at Camp Chesterfield via the snooperscope (along with a cast comprising most of that Camp's staff). Indeed mention Dark Seances and they almost always make the first assumption that it is not real.